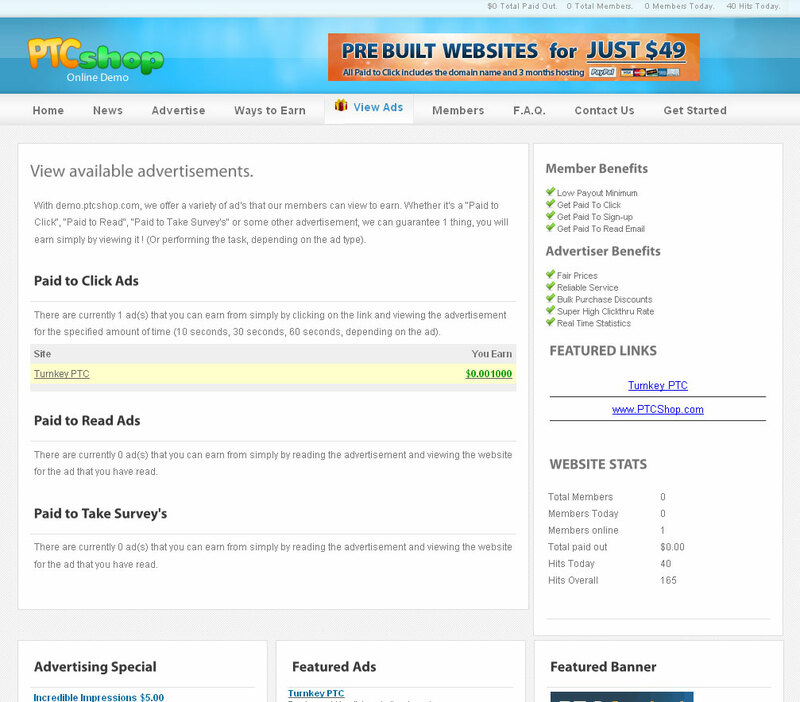 PTCShop Web Script - Get paid to click php / mysql website script - start a complete website business for under a hundredd dollars. Turnkey websites available at TurnkeyPTC.com that are pre-built and ready to take over. Featuring a full website script with "Paid to click", "Paid to take survey's", "Paid to read ad's", "Paid to sign up" and more! 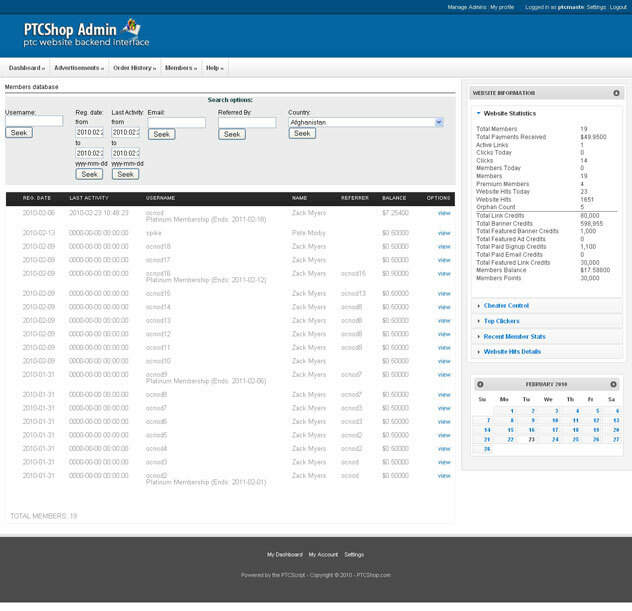 Learn how the PTCShop web script can benefit your business by running automated payouts with alertpay, automated order validation and approval via alertpay and paypal, and more! Put your business on auto-pilot and focus on what counts! 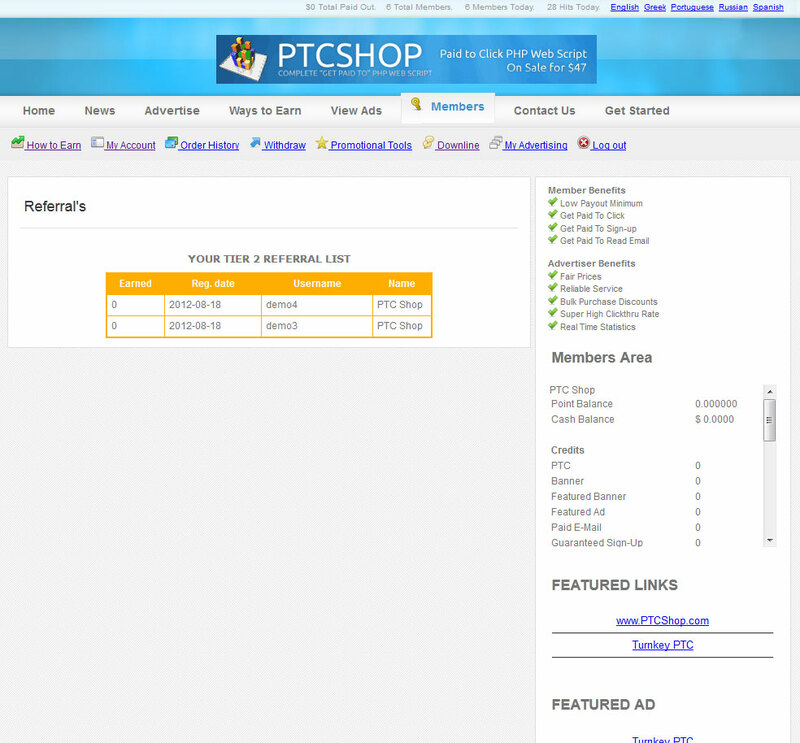 SITE: PTC Default home page This is the default welcome page for your visitors. 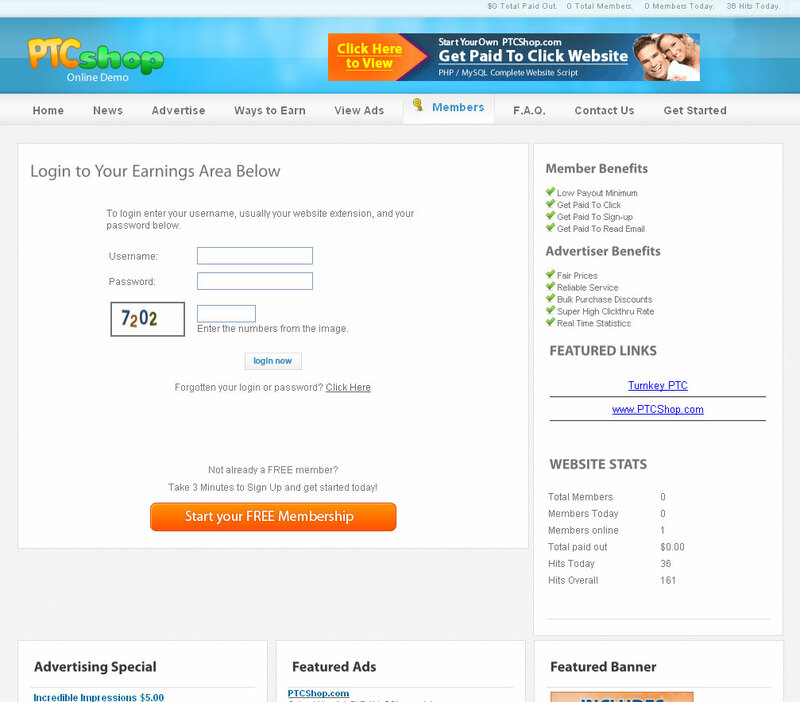 SITE: Get Started / Signup Form This is the form members use to join your website as an advertiser or earner. SITE: Members Login This is the members login, including CAPTCHA validation and optional secondary password support. SITE: Dynamic F.A.Q. 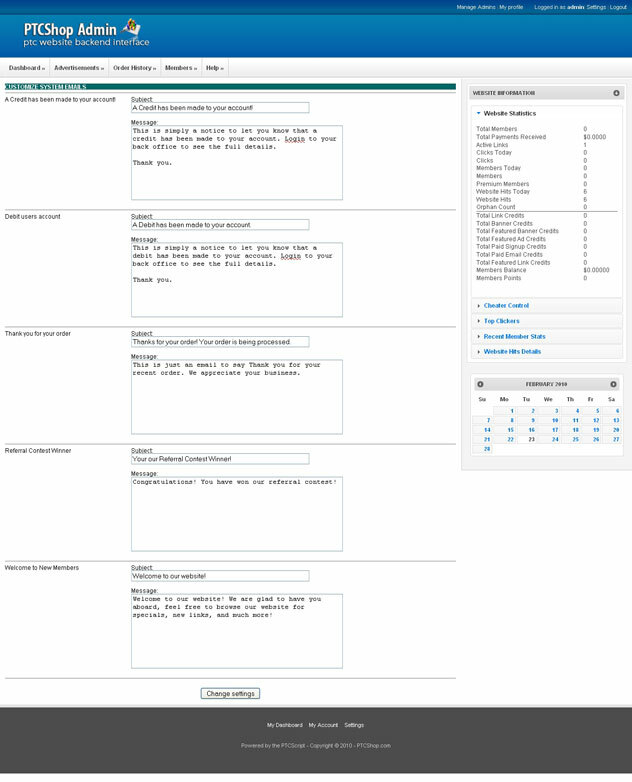 Area Frequently Asked Questions page for your members, easily updated in the admin panel. 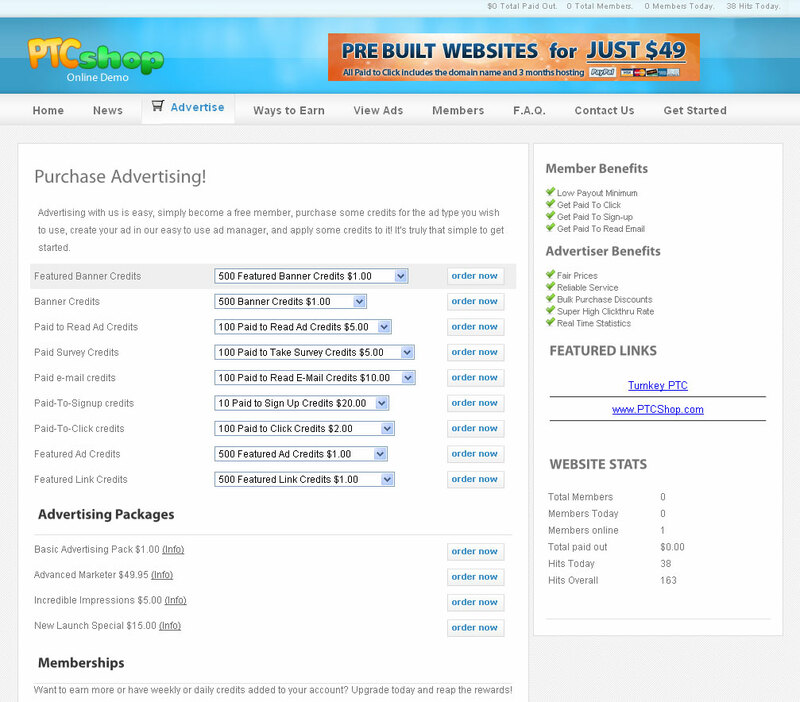 SITE: Advertisers Panel Complete Step by Step Advertising Purchase Panel. SITE: Multiple Ways to Earn There are a multitude of earning options for earners. 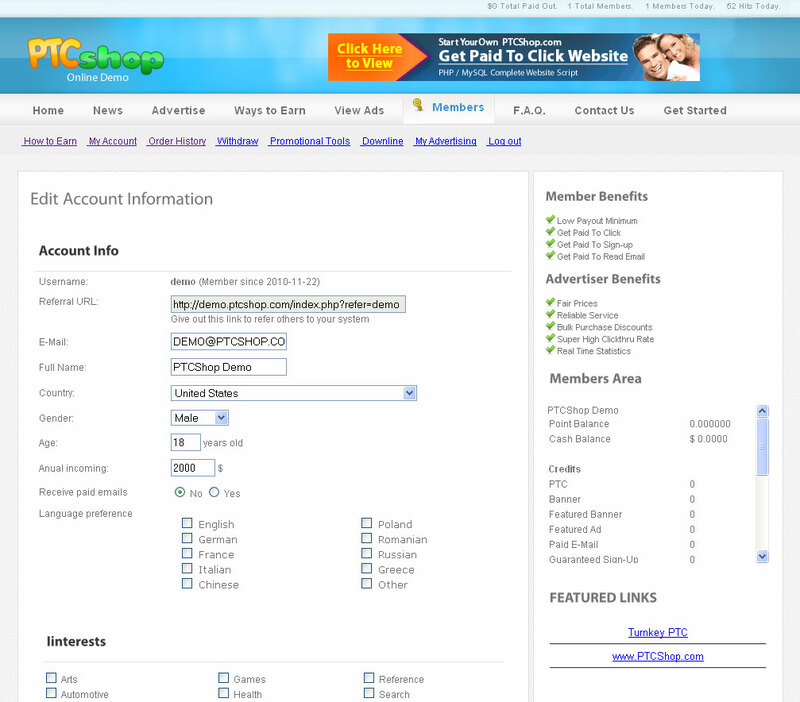 SITE: View Ads Page Show available advertisements to prospective members. 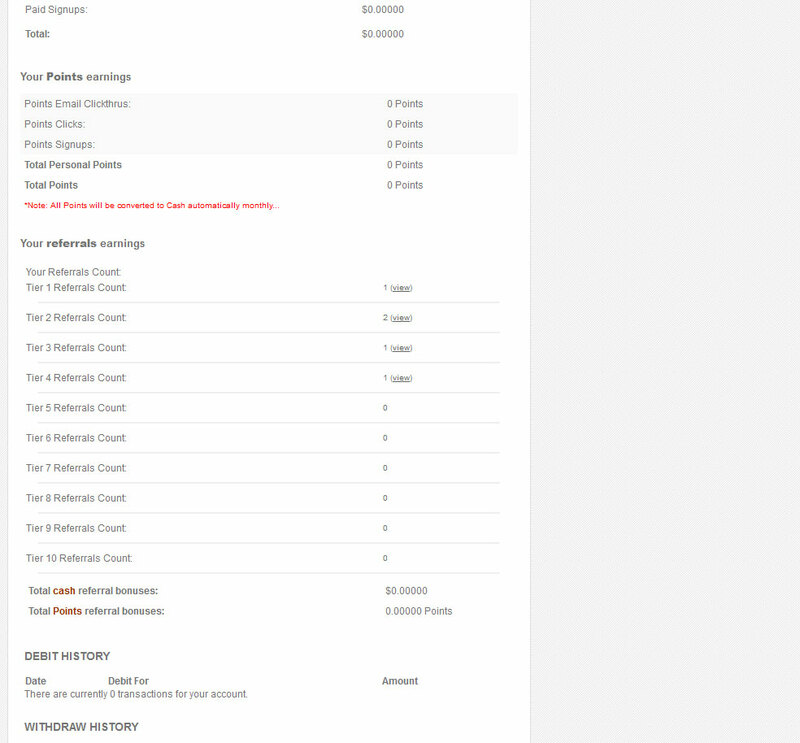 MEMBERS: Account Stats Detailed Account Statistics and Information. MEMBERS: Order History Active Order History and Tracking. MEMBERS: Withdraw Funds Easy Withdraw Methods including optional Cashout Pin. MEMBERS: Downline Overview View overview of how many referrals on each level. MEMBERS: Downline Level Overview View members of a downline level and their earnings. 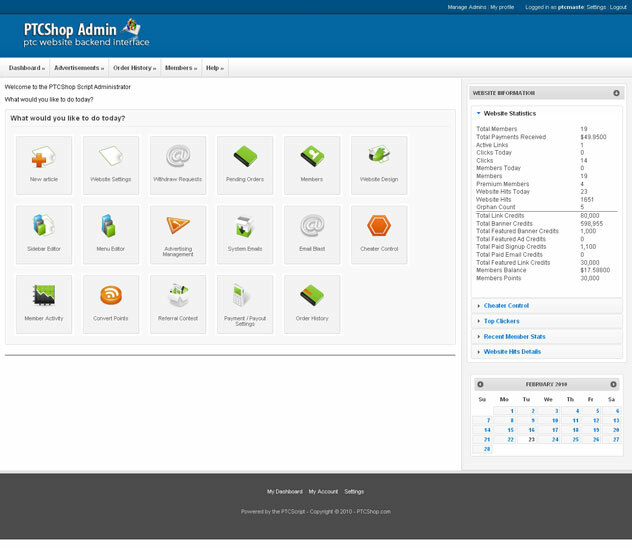 ADMIN: Dashboard Admin Panel Dashboard with Quick View Icons. 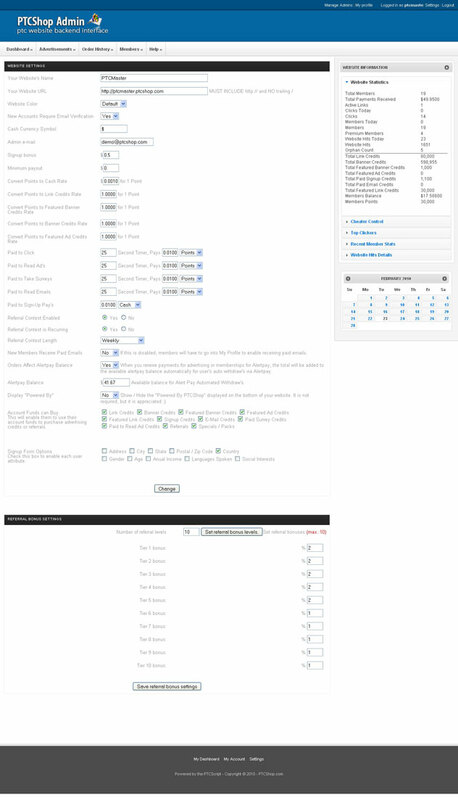 ADMIN: Settings Global Website Settings. 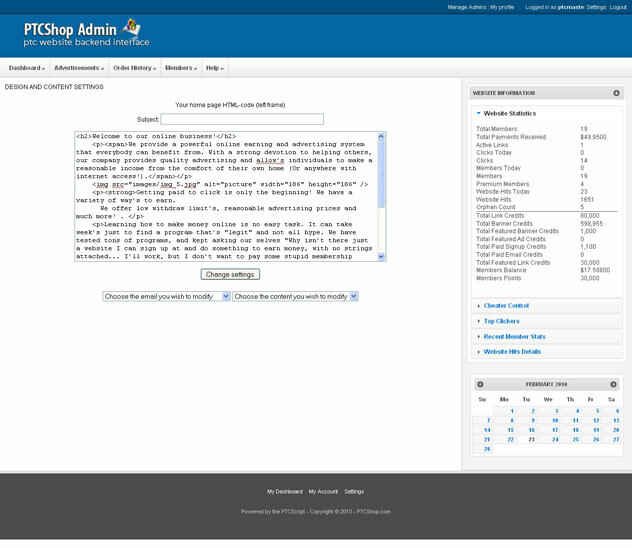 ADMIN: Content Editor Content Editor for your Website Pages. ADMIN: Payment and Withdraws Enable / Disable Payment and Withdraw Vendors. 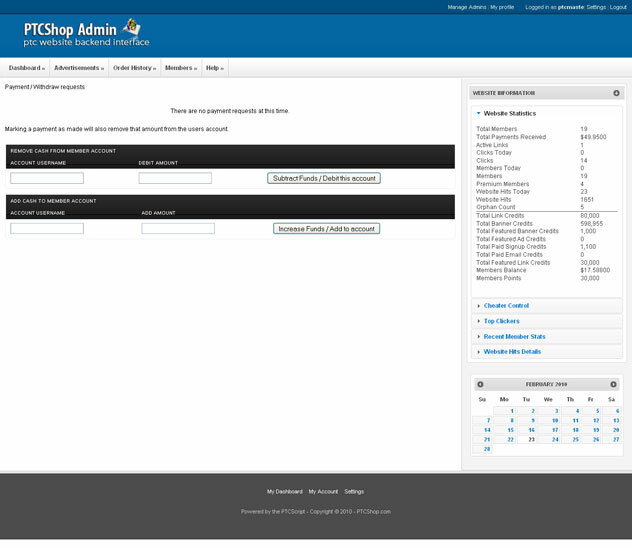 ADMIN: Membership Manager Easily create new memberships. ADMIN: Email Blasts Send an E-Mail Blast to All of your members. 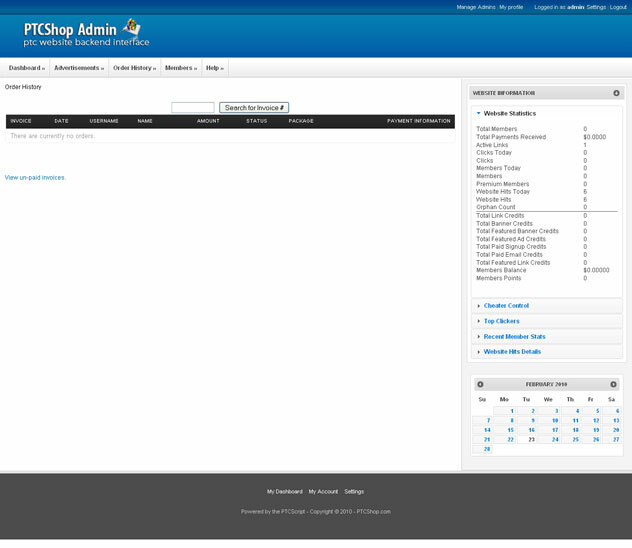 ADMIN: Dyanmic Site Menu Dynamic Website Menu Editor. ADMIN: System Email Editor Customize System E-Mails. 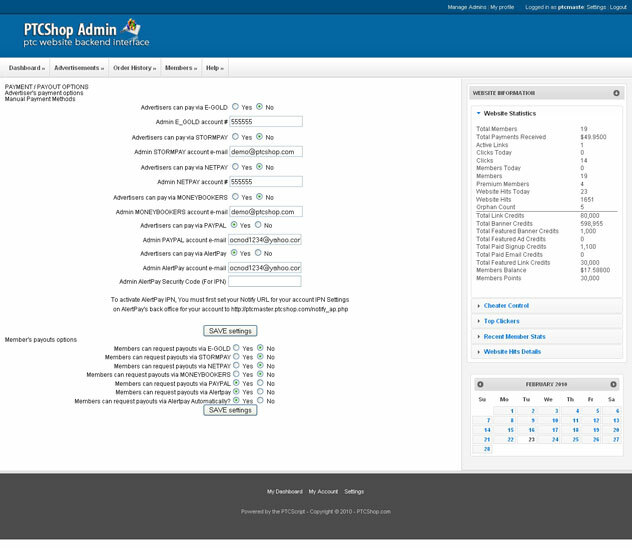 ADMIN: Ad Packs Editor Manage advertising specials and packages. 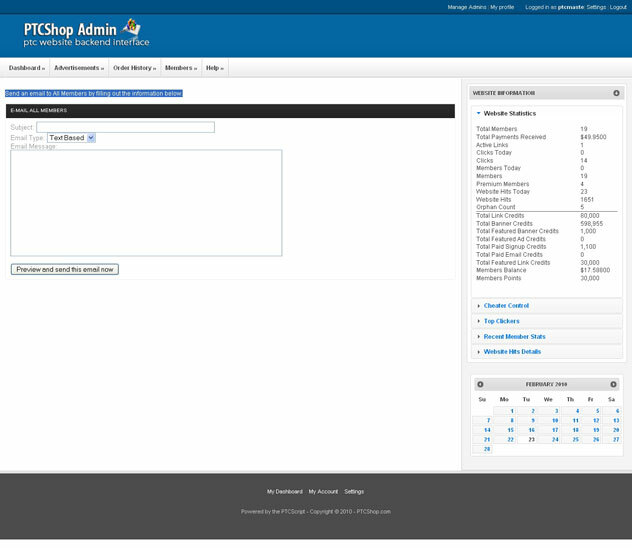 ADMIN: Membership Editor Quickly Manage Membership Types. 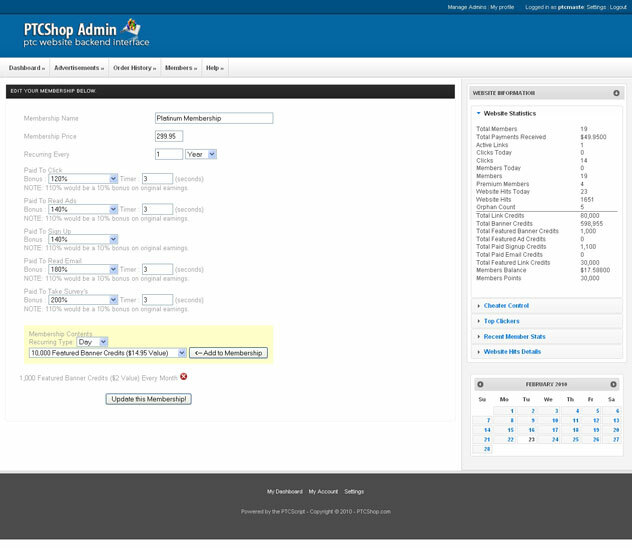 ADMIN: Member Details View detailed member information. ADMIN: Withdraw Manager Easily Credit / Debit user accounts and process withdraws. 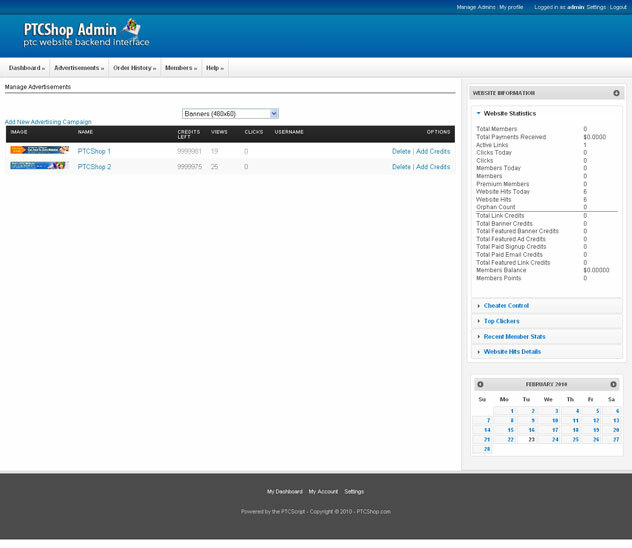 ADMIN: Member Management View and Search for Members. 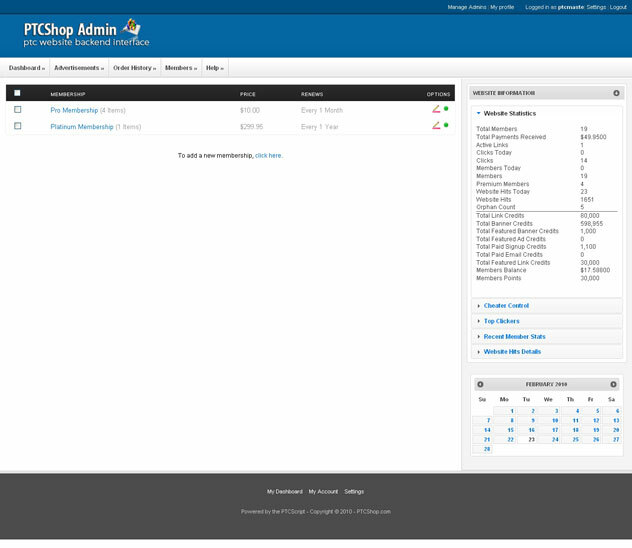 ADMIN: Order Management View Pending and Paid Invoices. 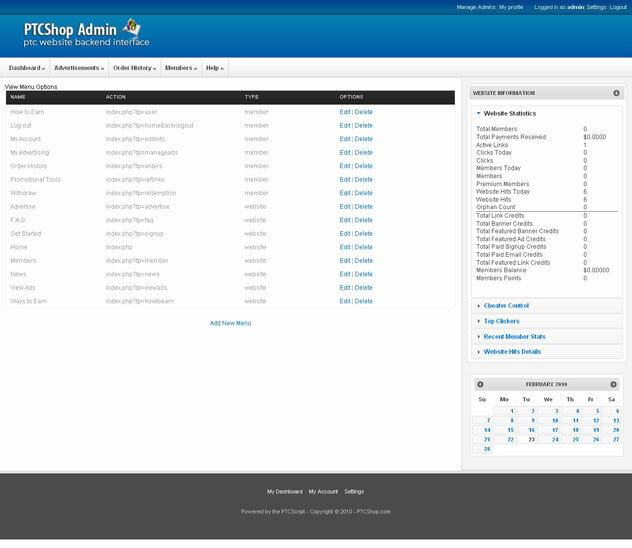 ADMIN: Ad Management Manage site advertisments easily.